One of the major concert providers in Singapore ceases activity this week, bringing to a close a season which has seen something not far off 200 public concerts, recitals and masterclasses. 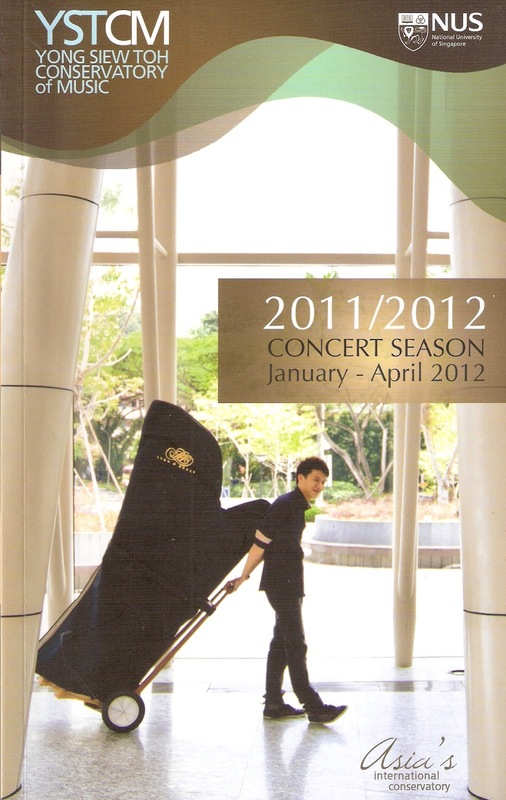 Not to worry, though, it all starts up again in August when the Yong Siew Toh Conservatory academic year resumes. In the meantime, Singaporeans will just have to look elsewhere for their daily fix of serious music- making – not that there will be any shortage of that with the Singapore Arts Festival just over the horizon, not to mention the countless other musical events taking place around the island. A major loser when the YST concert season closes is contemporary music. 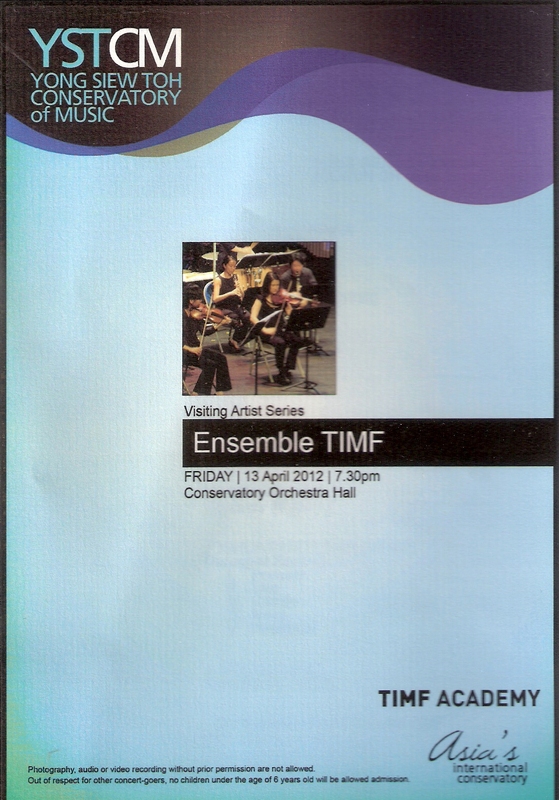 Certainly there are plenty of concerts of contemporary music around, but with its commitment to encourage and promote the work of its own composition students as well as to offer them an environment in which they can hear live performances of works by living composers, it has given a huge amount of exposure to new music in Singapore. There has been music by living composers at most of the Monday lunchtime recitals since last August while, in just two typical months we had the New Zealand Chamber soloists performing music by Gareth Farr (b.1968) and John Psathos (b.1966) on 10th January, the Australian Brass Quintet with Aaron Jay Kernis (b,1960), David Sampson (b.1951), Michael Tilson Thomas (b.1944) , Joan Tower (b.1938), Iain Gradage (b.1976) and Anthony Plog (b.1947) on 13th January, the Southern Cross Soloists with music by Paul Stanhope (b.1969) in their concert on the 21st January, while Jason Lai led the Conservatory Orchestra in the Asian première of a double bass concerto by Frank Proto (b.1947) on 31st January. And in February, the Thai composer Anothai Nitibhon gave a masterclass and seminar on 6th February, a locally-based ensemble, Ang Mo Faux, gave a performance of genuinely "living" music on 8th February, Marques Young, trombonist with the Malaysian Philharmonic Orchestra, presented music by himself as well as by Richard Peaslee (b.1930) on the 13th and the concerto chosen by Thai tubist Thunyawat Thangtrakul for his appearance in the Conservatory's Concerto Competition was by James Woodward (b.1978). Tim Jansa (b.1974) had his Three Miniatures performed on 17th February at a Conservatory lunchtime concert at the Asian Civilizations Museum (interestingly the same work was performed by members of the SSO just yesterday) while American trumpeter Bill Theis gave us Joseph Turrin (b.1947) when he did his recital on 28th February. An encouraging aspect of nearly all those performances listed above is that works by living composers are integrated into programmes which cast their net across a wider chronological range. While this sort of programming is fairly recent – until the First World War music by several composers from several different eras of musical history were relatively rare – and first performances have traditionally been presented in concerts made up almost entirely of new music – a great example was the concert in Vienna on the evening of 22nd December 1808 when, over a four-hour programme, every work (including Symphonies 5 and 6, Piano Concerto 4 and the Choral Fantasia) were not only being given their world premières, but all were by the same composer, Beethoven – over the last 100 years programmes have tended to cover rather more territory. Indeed, when you do come across a concert made up almost entirely of new music, it has the feel of a niche event; the uncharitable might suggest it is the ghettoisation of new music. There was something of that "ghetto" feel about one of the final concerts in the YST season, which took place in the remote, utilitarian and clinically unfriendly surroundings of the Conservatory's Orchestra Hall last Friday. That it was happening a day after the final major concert of the season – a big orchestral spectacular given in the Esplanade – and on the evening of the last teaching day of the year, certainly did nothing to make it feel mainstream. Yet it was a very important concert and, moreover, one of considerable musical worth. 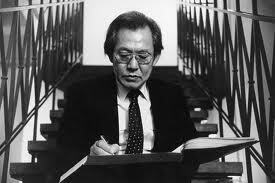 The performers – members of Korea's Ensemble TIMF – are specialists in the field of new music, and while three of the works were by YST students, there were some established pieces here, including one by a non-contemporary composer, Isang Yun (1917-1995). All the same, it was a concert clearly attracting only a specialist audience, and while I managed to persuade Straits Times to run a review, I feel that for once, I should reprint and expand on that review in order to bring some of this music to a wider attention. It is a sad fact of life for many aspiring composers that if they want their music publicly performed they must write it for small ensembles – cheaper to put on and involving fewer rehearsal man-hours – and accept that it will be performed at a concert devoted to new music and, consequently, attracting miniscule audiences. As it was, almost all the pieces performed to Friday's audience, which almost made it to 40 – respectable enough for a new music concert – could have happily been programmed alongside established standards which have passed through the cruelly unpredictable filter of long-term public taste. Memory, by the Japanese composer Toshio Hosokawa, and Man Jang by Mu-Seoh Kim, were calm, evocative tone pictures, the first comprising lots of long sustained overlapping notes, the second adding some ghostly vocalisations from the players to evoke traditional funeral rites. Isang Yun's Pezzo Fantasioso was a tour de force for the violin of Ho Jin Jeong, the flute of Joo Won Kim and the cello of Joo Eun Oh, in an ingenious piece of triple counterpoint. It took Young Woo Lee the entire length of the intermission and 10 minutes more to set up her piano for Ji-Young Kang's Schuplatter. But all those metal rulers and sheets of coloured tissue paper were worth the effort, for this was the most entertaining item in the programme. Setting off as a traditional Bavarian Ländler, the music gradually disintegrated until it became little more than rhythmic silence with the five players – clarinettist Yong Gen Lee had by now joined in – visibly playing their instruments but without any clear sounds emerging. The remainder of the concert was given over to music by the Conservatory's composition students. 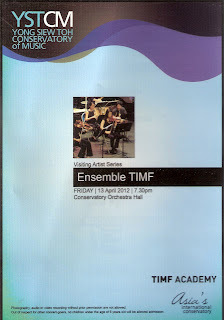 Chinese Xu Weiwei probably tried too hard to challenge the performers, but Ensemble TIMF are too good for that and not once, as they ploughed through her often dense explorations of instrument-created sound, did the thought surface that the result might not have justified the means. Malaysian Chow Jun Yan was both more serious and realistic in When Stillness Meets Motion, a tightly-knit piece which was very rewarding as abstract music even if a connection with its title and his own programme note was not readily apparent. For my money, the most successful work of the whole concert was Joshua Pangilinan's Dumagat Fantasy. Inspired by tribespeople of his native Philippines, this was no mere evocation of ethnic sights and sounds but a beautifully crafted and wholly coherent piece of writing which showed a keen understanding of instrumental colour. It may not be one of the classics of our time, but it deserves exposure to a much wider audience than 40 dedicated diehard aficionados of new music.